RNAO is inviting you to be part of the Workplace Liaison Program where more than 200 members are giving a voice to nurses. 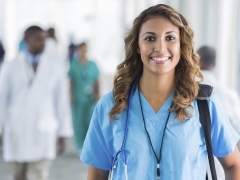 This is your opportunity to earn RNAO recruitment rewards, to create a visible presence for RNs and NPs in your workplace, and to connect with your colleagues about your shared pride in your profession. The Workplace Liaison Council, which oversees the program, is also looking for representatives from Region 2 (Huron-Perth, Oxford, Middlesex-Elgin), Region 3 (Brant, Niagara, and Hamilton), Region 5 (Grey-Bruce, South Simcoe, Muskoka-Huronia, and Parry Sound), Region 6 (Toronto West), Region 7 (Toronto East), Region 9 (Kingston, Champlain, Lanark Leeds Grenville, and Seaway), Region 10 (Ottawa) and Region 12 (Kenora-Rainy River, Lakehead and Sioux Lookout). As part of the council, you help to inspire and drive educational offerings for workplace liaisons as well as provide support for liaisons in their recruitment, retention and engagement efforts in their organizations. To volunteer for the Workplace Liaison Program or Workplace Liaison Council or for more information, please contact Patti Hogg at 1-800-268-7199 ext. 220 or by email at phogg@rnao.ca.